When the Kia brand first arrived on the scene, it was a laughing stock when it came to quality, performance, and style. Kia has come a long way since those early years and now the brand’s vehicles have a reputation for lasting a long time – even when they are classified as a used vehicle. Here at Poulin Auto Sales, Kia vehicles make a frequent appearance at our Barre and Colchester locations – and they are always a huge hit with our customers. Kia vehicles from the last few years are incredibly stylish and user-friendly – and there are several model options to choose from so there is definitely something that will match your needs and tastes. This includes sedans (like the Rio, Forte, Optima, and Cadenza), hatchbacks (Rio 5-Door and Forte5), minivans (Sedona), and crossovers (Soul, Sportage, Niro, and Sorento). Of course, the most recognizable model is the Kia Soul with its funky box-like shape and fun driving dynamics. No matter which model you choose, it will serve you well for all your driving adventures around Vermont and beyond. 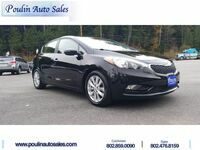 Kia vehicles are renowned for being very affordable when brand new, but why not save a few dollars! 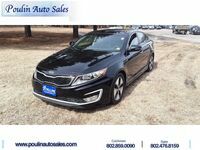 Thanks to value depreciation (which naturally occurs with all new vehicles), you can find low prices on used Kia vehicles that are still quite young here at Poulin Auto Sales. Like we said, Kia has seriously upped the ante when it comes to quality, so you know that you will be getting a dependable vehicle when you shop with us. And to ensure your safety and satisfaction, we perform a thorough inspection of each Kia vehicle before adding the “for sale” sticker. To learn about our current selection of used Kia vehicles, please check out our online inventory or visit our Barre and Colchester locations today!